The global tiller machines market is projected to grow at 2.6% CAGR and reach a valuation of US$ 2.68 Bn by 2026-end, according to a new research report by Transparency Market Research (TMR). Sluggishness in the global farm and garden equipment industry is likely to stymie the growth of the tiller machine market during the assessment period. According to the report, the steady demand for tiller machines is on account of growing awareness among residential and commercial consumers on the benefits of tiller machines. Although demand for new equipment has waned over the years, leasing and renting are gaining traction, which is promoting the growth of the tiller machines market. 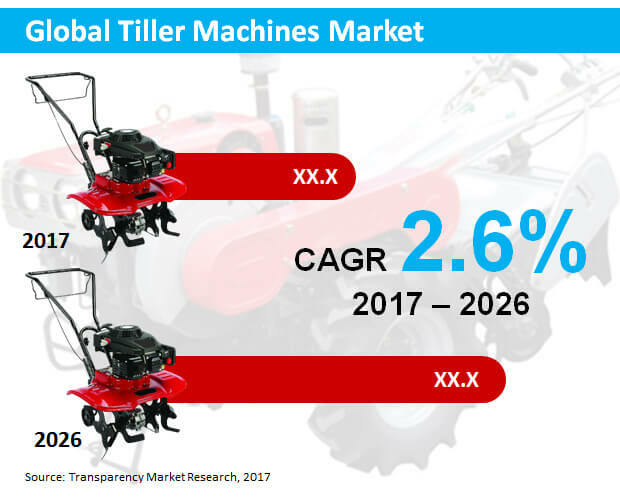 It is anticipated that proliferation of garden equipment rental companies will create growth opportunities for players in the tiller machines market. Among the various types of tiller machines available in the market – front tine, rear tine, and mini-cultivators – demand for front tine tiller machines has been observed to be the highest. Front tine tillers are suitable for most of the gardening work in households, and are an affordable option than rear tine and mini-cultivators. They can be easily maneuvered in small and medium garden plots, along with gardens with tight corners. On the back of these factors, demand for front tine tiller machines has remained steady over the years, and during the assessment period, this segment is projected to grow at 2.1% CAGR. On account of their range of benefits, including ease of use and convenience, electric tiller machines are becoming sought-after among residential and commercial consumers. Although hydraulic tiller machines currently account for a higher revenue share of the market, demand for electric tiller machines is likely to grow at a higher rate during the assessment period. By the end of forecast period, electric tiller machines are likely to reach a valuation of nearly US$ 1.32 Bn by the end of 2026. Tiller machines are available in a different widths, ranging from 9 inches to over 36 inches. Currently, demand for 9 inch wide tilling machines is the highest, and 14 inch wide tilling machines second prominent segment among end-users. According to the report, demand for 9 inch wide tilling machines is likely to surpass US$ 490 Mn by the end of the forecast period. The demand for 40 HP to 60 HP power capacity tilling machines is the highest among end-users, and the status quo is likely to remain unchanged during the assessment period. 40 HP to 60 HP power capacity tilling machines are suitable for a wide range of gardening equipment tasks in households. By the end of forecast period, the 40 HP to 60 HP power capacity tilling machines segment is likely to reach a valuation of US$ 896 Mn by the end of the forecast period. Long replacement cycles, sluggishness in garden equipment industry, and other macroeconomic factors have influenced manufacturers to adapt to the evolving landscape. As APEJ is likely to offer steady growth opportunities to manufacturers, manufacturers are focusing on launching an affordable range of products to cater to the needs of a cost-sensitive consumer base. Some of the key players operating in the market include AGCO Corp, CLAAS KGaA mbH, Kubota Corporation , Tractor and Farm Equipment Limited, Deere & Company, Mahindra & Mahindra Ltd., EXEL Industries, SDF S.p.A., ISEKI & CO. LTD., CNH Industrial N.V.., Bucher Industries AG, Eurometal MIO, Sharp Garuda Farm Equipments Pvt Ltd, Yanmar Co., Ltd., and Kuhn North America Inc.